SiriusDecisions is a B2B research and advisory firm that helps businesses make smart, precise decisions about sales, marketing, and product moves that will make them more money and promote company growth. The company was founded in Wilton, Connecticut in 2001. In 2018 it was announced that Forrester would acquire SiriusDecisions in 2019. SiriusDecisions helps account-based marketers design and implement account-based marketing strategies that leverage best practices, expedite value creation, win internal support and enlarge the overall pool of ABM experts. We provide clients with a tactical plan, instill confidence to execute against it, and provide access to experts and other customers that is unrivaled in our industry. SiriusDecisions helps brand and communications leaders gain strategic relevance internally and put forth the most effective brand and communications programs externally based on best practices, benchmark data, research and tools that are completely centered on the needs of b-to-b companies. Whether the objective is to build a stronger brand presence, connect with key influencers, drive higher levels of employee engagement or optimize social media channels, SiriusDecisions provides the structured approaches and practical advice that brand and communications leaders need to demonstrate business impact. SiriusDecisions helps channel marketing leaders develop a strategic channel marketing function, emphasizing cross-functionally aligned planning, channel demand creation, partner enablement and engagement programs. We help organizations design and manage best-in-class channel partner programs, measure ROI and create a detailed roadmap that charts a course for the evolution of the function. SiriusDecisions is recognized for its unmatched channel marketing expertise, credibility and best practice thought leadership. SiriusDecisions helps channel sales leaders achieve corporate revenue goals. We provide benchmark data and industry best practices to help clients secure executive support and budget for channel sales initiatives. We identify the characteristics that define ideal partners, identify the key metrics for tracking partnerships, develop world-class channel sales strategies and optimize the executional dimension of these relationships. We have the distinct capability to help clients see the channel sales “big picture,” and we collaborate with them each step of the way to ensure a successful outcome. SiriusDecisions helps CMOs elevate marketing’s role and their own standing within the organization by forging tighter bonds between marketing and business strategy, improving marketing’s link to company performance, gauging whether marketing structural changes are needed, and boosting marketers’ talent and productivity. We provide marketing leaders with the tools, experiences and best practice learnings to deliver standout results, craft the right structures for success and smoothly navigate change. SiriusDecisions is a leader in content strategy, content marketing and content operations with the expert knowledge, models and benchmark data that b-to-b companies need to intelligently and prescriptively transform their content ecosystems from constant challenges into competitive differentiators. By working with our analysts and leveraging our research, clients can more effectively manage and measure content process and performance, and meet the multi-audience, multichannel, and multilingual needs of their sales and marketing teams. SiriusDecisions helps customer engagement leaders justify to senior management the imperative for a new role aimed at getting and keeping customers loyal. We effectively pioneered the concept of customer engagement, helping organizations define their needs, overcome challenges and access the tools they need to make the case for customer engagement. SiriusDecisions brings unmatched expertise, history and credibility in B2B marketing and sales, which uniquely positions us to help clients plan for and create world-class marketing operations capabilities. Our advisory services, access to better data, specialized toolkits and best practice models gives organizations a powerful combination of resources that no other firm can deliver. 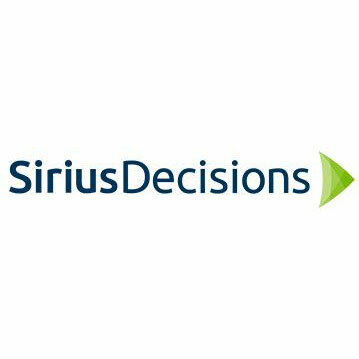 SiriusDecisions helps portfolio marketing leaders perfect their craft by designing an audience-centric go-to-market strategy, developing deep buyer insights, creating messaging that resonates, taking a strategic approach to launch and driving more revenue with the right sales enablement programs. Through our proprietary research and expert advice, portfolio marketers are able to demonstrate their ability to help grow the business and make it run more efficiently. SiriusDecisions helps sales enablement leaders prioritize enablement efforts to ensure every rep has the skills, knowledge, process expertise and access to the assets to maximize every buyer interaction. We do this through the lenses of sales talent management, sales asset management and sales communications management. We help clients define and elevate the role of sales enablement within their organizations, with an emphasis on cross-functional collaboration. SiriusDecisions’ combination of in-depth research, data, proven frameworks and expertise are unique in the industry. Our models, plus benchmark data gathered from similar organizations, enable sales operations leaders to accurately assess the state of the sales operations function and ensure they are providing the strategic needs required by sales leaders. We help you combine your data with analytics to deliver sales intelligence through audience-centric reporting. We align your sales processes with tools and technologies that enable you to interlock with internal functions, keep sales reps engaged, increase efficiencies and deliver a best-in-class customer experience. We’re available when you need us – to brainstorm your next move and translate best practices into actions tailored to your specific reporting needs.